PRODUCTION ZONE: a vineyard in the district of Paderno Franciacorta. VINE AND VINIFICATION: Franciacorta D. 0. C. G. Saten is made clonal selections of Chardonnay grapes hand-picked into small boxes, with slow pressing of the whole bunches. Fermentation and refinement takes place in small Allier oak barrels. Bottling occurs in March and April and the sparkling process is begun. The bottles are stacked in rooms with a controlled temperature of 12-14°C for at least 36 months. Only then will Franciacorta D.O.C.G. Saten achieve its distinctive smell and taste and its fine perlage. ORGANOLEPTIC CHARACTERISTICS: Yellow with light golden highlights. Very fine and persistent perlage. An intense bouquet with a mixture of peach, honey and hazelnuts. 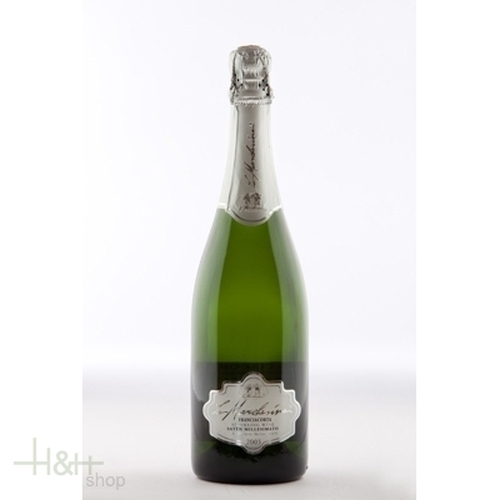 An elegantly fresh, vivacious and full Franciacorta, characterized by pleasing fruity and floral aromas. Obtained Chardonnay grapes after more than 24 months on yeasts. Excellent as an aperitif but it can also be served throughout a meal; it is particularly suitable for delicate dishes of fish and white meat. It is gently sweet and fresh on the palate and pleasantly light in alcohol, extremely smooth and well-balanced with long and fruity finish. With its great versatility, Giall'Oro can be enjoyed equally well as an aperitif or to enhance the close of a meal. Indeed, this is a wine that can brighten up any hour of the day.